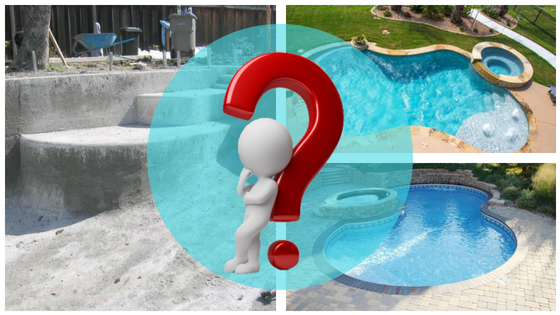 Fiberglass, Vinyl Or Concrete Pool-Which One Is The Better? Which is the Best Pool Type: Fiberglass, Vinyl, Or Concrete? As far as swimming pool construction is concerned, there are three types of pools that are typically favored: Concrete Pools, Fiberglass Pools, and Vinyl Liner Pools. What type of pool is the best for my place? To answer this question let us take up the pros and cons of each type of pool. It is one of the primary reasons for the increasing popularity of fiberglass pools. Since they are manufactured off-site, the swimming pool installation time is reduced by almost 3-5 days when compared to the other types, which makes quite a difference. Did you know that the owners of fiberglass pools spend up to 70% of less money and time for their pool maintenance? It is because the surface of fiberglass is non-porous which makes algae formation difficult. So it is easier to clean them. Fiberglass Pools are quite enduring. Thus you need not worry about damaging the pool while using it yourself or while letting your dog inside the pool. Due to the merits of fiberglass pools like low maintenance and high durability, they can give you a higher resale value in case you decide to sell your property. Since the upkeep and maintenance of the fiberglass pools are low, the cost involved is also quite less. Ultimately, it leads to low cost of ownership over the years. Fiberglass pools can be designed to suit your place with the help of ceramic tiles, colored edges, spectacular pool lights, impressive water features, and so on. It can transform the outlook of your place entirely. Although most people find fiberglass pool to their liking, these pools do not allow for many customizations. In case you are looking for a unique shape or 10’ deep pool, it is not the right fit for you. Even though the cost for upkeep of fiberglass pool is low, the initial expense is quite high compared to other pool types. So if you do not have the liberty to spend a little more than the usual, it is not an ideal option for you. Despite the fact that most of the vinyl pools are rectangular, any customization in the form of pool design, shape, size, depth is possible. In case you are looking for an affordable pool for your place, vinyl liner inground pools are ideal. They are quite inexpensive when compared to the other types of pools and can fit right into your budget. Vinyl pools have a smooth surface which makes them non-abrasive. Though the liner warranty lasts for up to twenty years, it might not cover all the desired aspects. The cost of liner replacement and its frequency are major disadvantages of vinyl liner pools. So it can prove to be little expensive in the long run. Despite the smooth surface, algae growth is possible in vinyl pools. Concrete pools are durable in the sense that you do not have to worry about damaging them while using the pool which is why they are preferred by many. Moreover, they can withstand any climate. If you want a customized pool with regards to the shape, size or depth, concrete pools are right for you. They can be built as per to your specifications. They offer great aesthetics and structural designs. Concrete pools take up a lot of time for installation, almost up to 3-6 months. The rough interior surface harbors algae growth and can be a problem for tender feet. Due to its porous nature, concrete pool requires regular maintenance. In fact, it is recommended to clean the pool once every week. Due to the growth of algae, more chemicals are used in case of concrete pools. So the pH level of pool water might be an issue. The cost of owning a concrete pool is exponentially high due to increased maintenance required to keep it in excellent condition. Which one should you choose from different types of swimming pools? Well, there is no specific answer to this question because it depends on several factors. So you must weigh the pros and cons of each pool type and decide accordingly. For more information on swimming pool construction and swimming pool installation, you can reach out to us on 416.504.5263.